↑ "Diseases that are genetically associated with MAPK1 view/edit references on wikidata". ↑ Owaki H, Makar R, Boulton TG, Cobb MH, Geppert TD (February 1992). "Extracellular signal-regulated kinases in T cells: characterization of human ERK1 and ERK2 cDNAs". Biochem. Biophys. Res. Commun. 182 (3): 1416–22. doi:10.1016/0006-291X(92)91891-S. PMID 1540184. ↑ "Entrez Gene: MAPK1 mitogen-activated protein kinase 1". ↑ "Dysmorphology data for Mapk1". Wellcome Trust Sanger Institute. ↑ "Clinical chemistry data for Mapk1". Wellcome Trust Sanger Institute. ↑ "Salmonella infection data for Mapk1". Wellcome Trust Sanger Institute. ↑ "Citrobacter infection data for Mapk1". Wellcome Trust Sanger Institute. 1 2 3 4 Gerdin, AK (2010). "The Sanger Mouse Genetics Programme: High throughput characterisation of knockout mice". Acta Ophthalmologica. 88: 925–7. doi:10.1111/j.1755-3768.2010.4142.x. ↑ Skarnes WC, Rosen B, West AP, Koutsourakis M, Bushell W, Iyer V, Mujica AO, Thomas M, Harrow J, Cox T, Jackson D, Severin J, Biggs P, Fu J, Nefedov M, de Jong PJ, Stewart AF, Bradley A (2011). "A conditional knockout resource for the genome-wide study of mouse gene function". Nature. 474 (7351): 337–42. doi:10.1038/nature10163. PMC 3572410 . PMID 21677750. ↑ Dolgin E (2011). "Mouse library set to be knockout". Nature. 474 (7351): 262–3. doi:10.1038/474262a. PMID 21677718. ↑ Collins FS, Rossant J, Wurst W (2007). "A mouse for all reasons". Cell. 128 (1): 9–13. doi:10.1016/j.cell.2006.12.018. PMID 17218247. ↑ van der Weyden L, White JK, Adams DJ, Logan DW (2011). "The mouse genetics toolkit: revealing function and mechanism". Genome Biol. 12 (6): 224. doi:10.1186/gb-2011-12-6-224. PMC 3218837 . PMID 21722353. ↑ Díaz-Rodríguez E, Montero JC, Esparís-Ogando A, Yuste L, Pandiella A (June 2002). "Extracellular signal-regulated kinase phosphorylates tumor necrosis factor alpha-converting enzyme at threonine 735: a potential role in regulated shedding". Mol. Biol. Cell. 13 (6): 2031–44. doi:10.1091/mbc.01-11-0561. PMC 117622 . PMID 12058067. ↑ Voong LN, Slater AR, Kratovac S, Cressman DE (April 2008). "Mitogen-activated protein kinase ERK1/2 regulates the class II transactivator". J. Biol. Chem. 283 (14): 9031–9. doi:10.1074/jbc.M706487200. PMC 2431044 . PMID 18245089. ↑ Slack DN, Seternes OM, Gabrielsen M, Keyse SM (May 2001). "Distinct binding determinants for ERK2/p38alpha and JNK map kinases mediate catalytic activation and substrate selectivity of map kinase phosphatase-1". J. Biol. Chem. 276 (19): 16491–500. doi:10.1074/jbc.M010966200. PMID 11278799. ↑ Calvisi DF, Pinna F, Meloni F, Ladu S, Pellegrino R, Sini M, Daino L, Simile MM, De Miglio MR, Virdis P, Frau M, Tomasi ML, Seddaiu MA, Muroni MR, Feo F, Pascale RM (June 2008). "Dual-specificity phosphatase 1 ubiquitination in extracellular signal-regulated kinase-mediated control of growth in human hepatocellular carcinoma". Cancer Res. 68 (11): 4192–200. doi:10.1158/0008-5472.CAN-07-6157. PMID 18519678. ↑ Aoyama K, Nagata M, Oshima K, Matsuda T, Aoki N (July 2001). "Molecular cloning and characterization of a novel dual specificity phosphatase, LMW-DSP2, that lacks the cdc25 homology domain". J. Biol. Chem. 276 (29): 27575–83. doi:10.1074/jbc.M100408200. PMID 11346645. ↑ Todd JL, Tanner KG, Denu JM (May 1999). "Extracellular regulated kinases (ERK) 1 and ERK2 are authentic substrates for the dual-specificity protein-tyrosine phosphatase VHR. A novel role in down-regulating the ERK pathway". J. Biol. Chem. 274 (19): 13271–80. doi:10.1074/jbc.274.19.13271. PMID 10224087. 1 2 3 Eblen ST, Kumar NV, Shah K, Henderson MJ, Watts CK, Shokat KM, Weber MJ (April 2003). "Identification of novel ERK2 substrates through use of an engineered kinase and ATP analogs". J. Biol. Chem. 278 (17): 14926–35. doi:10.1074/jbc.M300485200. PMID 12594221. ↑ Cano E, Hazzalin CA, Kardalinou E, Buckle RS, Mahadevan LC (November 1995). "Neither ERK nor JNK/SAPK MAP kinase subtypes are essential for histone H3/HMG-14 phosphorylation or c-fos and c-jun induction". J. Cell. Sci. 108 (11): 3599–609. PMID 8586671. ↑ Purcell NH, Darwis D, Bueno OF, Müller JM, Schüle R, Molkentin JD (February 2004). "Extracellular signal-regulated kinase 2 interacts with and is negatively regulated by the LIM-only protein FHL2 in cardiomyocytes". Mol. Cell. Biol. 24 (3): 1081–95. doi:10.1128/mcb.24.3.1081-1095.2004. PMC 321437 . PMID 14729955. ↑ Zhou X, Richon VM, Wang AH, Yang XJ, Rifkind RA, Marks PA (December 2000). "Histone deacetylase 4 associates with extracellular signal-regulated kinases 1 and 2, and its cellular localization is regulated by oncogenic Ras". Proc. Natl. Acad. Sci. U.S.A. 97 (26): 14329–33. doi:10.1073/pnas.250494697. PMC 18918 . PMID 11114188. 1 2 Sanz-Moreno V, Casar B, Crespo P (May 2003). "p38alpha isoform Mxi2 binds to extracellular signal-regulated kinase 1 and 2 mitogen-activated protein kinase and regulates its nuclear activity by sustaining its phosphorylation levels". Mol. Cell. Biol. 23 (9): 3079–90. doi:10.1128/mcb.23.9.3079-3090.2003. PMC 153192 . PMID 12697810. ↑ Robinson FL, Whitehurst AW, Raman M, Cobb MH (April 2002). "Identification of novel point mutations in ERK2 that selectively disrupt binding to MEK1". J. Biol. Chem. 277 (17): 14844–52. doi:10.1074/jbc.M107776200. PMID 11823456. 1 2 Yeung K, Janosch P, McFerran B, Rose DW, Mischak H, Sedivy JM, Kolch W (May 2000). "Mechanism of suppression of the Raf/MEK/extracellular signal-regulated kinase pathway by the raf kinase inhibitor protein". Mol. Cell. Biol. 20 (9): 3079–85. doi:10.1128/mcb.20.9.3079-3085.2000. PMC 85596 . PMID 10757792. ↑ Wunderlich W, Fialka I, Teis D, Alpi A, Pfeifer A, Parton RG, Lottspeich F, Huber LA (February 2001). "A novel 14-kilodalton protein interacts with the mitogen-activated protein kinase scaffold mp1 on a late endosomal/lysosomal compartment". J. Cell Biol. 152 (4): 765–76. doi:10.1083/jcb.152.4.765. PMC 2195784 . PMID 11266467. ↑ Stippec S, Robinson FL, Cobb MH (July 2001). "Hydrophobic as well as charged residues in both MEK1 and ERK2 are important for their proper docking". J. Biol. Chem. 276 (28): 26509–15. doi:10.1074/jbc.M102769200. PMID 11352917. ↑ Chen Z, Cobb MH (May 2001). "Regulation of stress-responsive mitogen-activated protein (MAP) kinase pathways by TAO2". J. Biol. Chem. 276 (19): 16070–5. doi:10.1074/jbc.M100681200. PMID 11279118. ↑ Karandikar M, Xu S, Cobb MH (December 2000). "MEKK1 binds raf-1 and the ERK2 cascade components". J. Biol. Chem. 275 (51): 40120–7. doi:10.1074/jbc.M005926200. PMID 10969079. ↑ Tanoue T, Maeda R, Adachi M, Nishida E (February 2001). "Identification of a docking groove on ERK and p38 MAP kinases that regulates the specificity of docking interactions". EMBO J. 20 (3): 466–79. doi:10.1093/emboj/20.3.466. PMC 133461 . PMID 11157753. 1 2 Waskiewicz AJ, Flynn A, Proud CG, Cooper JA (April 1997). "Mitogen-activated protein kinases activate the serine/threonine kinases Mnk1 and Mnk2". EMBO J. 16 (8): 1909–20. doi:10.1093/emboj/16.8.1909. PMC 1169794 . PMID 9155017. ↑ Scheper GC, Parra JL, Wilson M, Van Kollenburg B, Vertegaal AC, Han ZG, Proud CG (August 2003). "The N and C termini of the splice variants of the human mitogen-activated protein kinase-interacting kinase Mnk2 determine activity and localization". Mol. Cell. Biol. 23 (16): 5692–705. doi:10.1128/mcb.23.16.5692-5705.2003. PMC 166352 . PMID 12897141. ↑ Jin Z, Gao F, Flagg T, Deng X (September 2004). "Tobacco-specific nitrosamine 4-(methylnitrosamino)-1-(3-pyridyl)-1-butanone promotes functional cooperation of Bcl2 and c-Myc through phosphorylation in regulating cell survival and proliferation". J. Biol. Chem. 279 (38): 40209–19. doi:10.1074/jbc.M404056200. PMID 15210690. ↑ Gupta S, Davis RJ (October 1994). "MAP kinase binds to the NH2-terminal activation domain of c-Myc". FEBS Lett. 353 (3): 281–5. doi:10.1016/0014-5793(94)01052-8. PMID 7957875. ↑ Tournier C, Whitmarsh AJ, Cavanagh J, Barrett T, Davis RJ (July 1997). "Mitogen-activated protein kinase kinase 7 is an activator of the c-Jun NH2-terminal kinase". Proc. Natl. Acad. Sci. U.S.A. 94 (14): 7337–42. doi:10.1073/pnas.94.14.7337. PMC 23822 . PMID 9207092. ↑ Lou Y, Xie W, Zhang DF, Yao JH, Luo ZF, Wang YZ, Shi YY, Yao XB (August 2004). "Nek2A specifies the centrosomal localization of Erk2". Biochem. Biophys. Res. Commun. 321 (2): 495–501. doi:10.1016/j.bbrc.2004.06.171. PMID 15358203. ↑ Formstecher E, Ramos JW, Fauquet M, Calderwood DA, Hsieh JC, Canton B, Nguyen XT, Barnier JV, Camonis J, Ginsberg MH, Chneiweiss H (August 2001). "PEA-15 mediates cytoplasmic sequestration of ERK MAP kinase". Dev. Cell. 1 (2): 239–50. doi:10.1016/s1534-5807(01)00035-1. PMID 11702783. ↑ Pettiford SM, Herbst R (February 2000). "The MAP-kinase ERK2 is a specific substrate of the protein tyrosine phosphatase HePTP". Oncogene. 19 (7): 858–69. doi:10.1038/sj.onc.1203408. PMID 10702794. ↑ Saxena M, Williams S, Brockdorff J, Gilman J, Mustelin T (April 1999). "Inhibition of T cell signaling by mitogen-activated protein kinase-targeted hematopoietic tyrosine phosphatase (HePTP)". J. Biol. Chem. 274 (17): 11693–700. doi:10.1074/jbc.274.17.11693. PMID 10206983. 1 2 Smith JA, Poteet-Smith CE, Malarkey K, Sturgill TW (January 1999). "Identification of an extracellular signal-regulated kinase (ERK) docking site in ribosomal S6 kinase, a sequence critical for activation by ERK in vivo". J. Biol. Chem. 274 (5): 2893–8. doi:10.1074/jbc.274.5.2893. PMID 9915826. 1 2 Roux PP, Richards SA, Blenis J (July 2003). "Phosphorylation of p90 ribosomal S6 kinase (RSK) regulates extracellular signal-regulated kinase docking and RSK activity". Mol. Cell. Biol. 23 (14): 4796–804. doi:10.1128/mcb.23.14.4796-4804.2003. PMC 162206 . PMID 12832467. 1 2 Zhao Y, Bjorbaek C, Moller DE (November 1996). 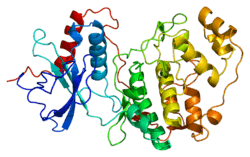 "Regulation and interaction of pp90(rsk) isoforms with mitogen-activated protein kinases". J. Biol. Chem. 271 (47): 29773–9. doi:10.1074/jbc.271.47.29773. PMID 8939914. ↑ Mitsushima M, Suwa A, Amachi T, Ueda K, Kioka N (August 2004). "Extracellular signal-regulated kinase activated by epidermal growth factor and cell adhesion interacts with and phosphorylates vinexin". J. Biol. Chem. 279 (33): 34570–7. doi:10.1074/jbc.M402304200. PMID 15184391. ↑ Pircher TJ, Petersen H, Gustafsson JA, Haldosén LA (April 1999). "Extracellular signal-regulated kinase (ERK) interacts with signal transducer and activator of transcription (STAT) 5a". Mol. Endocrinol. 13 (4): 555–65. doi:10.1210/mend.13.4.0263. PMID 10194762. ↑ Dinerstein-Cali H, Ferrag F, Kayser C, Kelly PA, Postel-Vinay M (August 2000). "Growth hormone (GH) induces the formation of protein complexes involving Stat5, Erk2, Shc and serine phosphorylated proteins". Mol. Cell. Endocrinol. 166 (2): 89–99. doi:10.1016/s0303-7207(00)00277-x. PMID 10996427. ↑ Zhang S, Fukushi M, Hashimoto S, Gao C, Huang L, Fukuyo Y, Nakajima T, Amagasa T, Enomoto S, Koike K, Miura O, Yamamoto N, Tsuchida N (September 2002). "A new ERK2 binding protein, Naf1, attenuates the EGF/ERK2 nuclear signaling". Biochem. Biophys. Res. Commun. 297 (1): 17–23. doi:10.1016/s0006-291x(02)02086-7. PMID 12220502. ↑ Maekawa M, Nishida E, Tanoue T (October 2002). "Identification of the Anti-proliferative protein Tob as a MAPK substrate". J. Biol. Chem. 277 (40): 37783–7. doi:10.1074/jbc.M204506200. PMID 12151396. ↑ Ma L, Chen Z, Erdjument-Bromage H, Tempst P, Pandolfi PP (April 2005). "Phosphorylation and functional inactivation of TSC2 by Erk implications for tuberous sclerosis and cancer pathogenesis". Cell. 121 (2): 179–93. doi:10.1016/j.cell.2005.02.031. PMID 15851026. ↑ Song JS, Gomez J, Stancato LF, Rivera J (October 1996). "Association of a p95 Vav-containing signaling complex with the FcepsilonRI gamma chain in the RBL-2H3 mast cell line. Evidence for a constitutive in vivo association of Vav with Grb2, Raf-1, and ERK2 in an active complex". J. Biol. Chem. 271 (43): 26962–70. doi:10.1074/jbc.271.43.26962. PMID 8900182. Morishima-Kawashima M, Hasegawa M, Takio K, Suzuki M, Yoshida H, Watanabe A, Titani K, Ihara Y (1995). "Hyperphosphorylation of tau in PHF". Neurobiol. Aging. 16 (3): 365–71; discussion 371–80. doi:10.1016/0197-4580(95)00027-C. PMID 7566346.